It is with heartache and regret when I see teenagers, young people and some adults plagued with acne problems bypassing our table at the market, not interested in being assisted by a humble bit of oil that might (in 95% of cases) solve their problem. But it is always the individual's choice to find help, to see a physician, to look at alternative methods of relieving their conditions. Rejuvinit was developed specifically to clear up the third degree burn scarring in my wife's face. While treating her scarring, she noticed that her hormone related acne, severe menorrhagia, pms and mood swings started becoming less and by the second month we no longer had a [dragon] in the house! Have you ever wondered why it is stated not to use essential oils during pregnancy? It is because certain natural ingredients may have an effect on the endocrine system and may bring your hormones into balance. You do not want this when you are pregnant or want to become pregnant. So, please do not use Rejuvinit containing products during pregnancy. As for the acne, adult acne and acne scarring. A dab of Rejuvinit may assist the user in clearing up their skin. We have found that in moderately affected people, three to six weeks is the average timeframe you are looking at and about three months with severely pitted skin. Teenagers have a different, difficult journey. They are still hormonal, their bodies growing up and most acne is a result of 'raging hormones'. In boys we suggest direct application of Rejuvinit and when the spots are under control, massage a drop of oil into the glands behind the ears every second or third day. For girls, it is best to use the Rejuvinit on a daily basis by either applying the oil directly to the spots, as a general beauty oil to the whole of the face, or applying two drops of oil to the skin on the abdomen (over the ovary area and uterus) to assist with painful periods. My daughter has experimented with Rejuvinit, abstaining from using the Rejuvinit for one month resulting in heavy bleeding, severe cramps and an unusual acne breakout. She told me that she was not going to do this to herself again. So another bottle of Rejuvinit was ordered by her. As most people use about two drops of Rejuvinit per day, it is an economical alternative to expensive products. 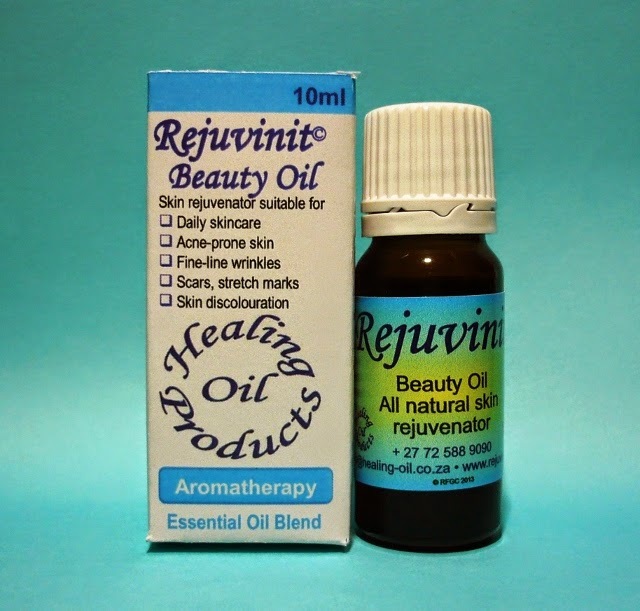 5ml of Rejuvinit contains approximately 125 drops of oil. So, next time you see us at a market, step over and have a chat. We might just be able to assist you as well. Buy Online. With clients in 35 countries, we ship World Wide. Order in from your local pharmacy or visit one of our selected Stockists. Simply Natural Health Shop (Next to Dischem) in the Canal Walk Mall, Century City, is currently our most popular stockist in Cape Town.